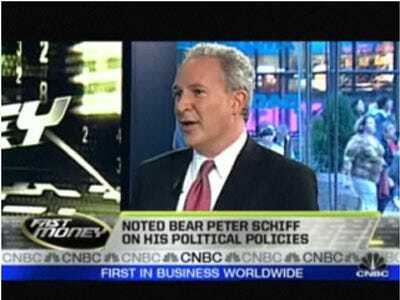 Senate candidate and investor Peter Schiff will now be a regular on CNBC. He sent out a note last night saying the Fast Money crew had invited him to be on twice a week. This is a huge boost to friends of the free market everywhere, and a demonstration of our increasing influence. While we believe in the principles of economic liberty, television networks must respond to ratings first. The fact that CNBC has given me a regular opportunity to share the free market viewpoint is a great credit to that organisation, but it’s up to you to reward them for promoting commentators that speak truth instead of propaganda.